Valuate.com quickly tells you which TLDs are registered. In August I wrote about contacting owners of .net and .org domain names that you own the .com version of. It’s an easy way to find end users to buy your domain names. But my explanation of how to bulk check for domains you own with .net and .org taken was a bit involved. As an added bonus, you’ll also get the other Valuate.com data including search results frequency, searches, traffic, advertiser competition, and average cost-per-click. Not bad for a free service. Try it out to find end users that have registered other versions of your .com domain names. You might find a whale. New web site from Domaining.com is very promising. Domaining.com founder Francois Carrillo works relentlessly to introduce new products. I like some more than others. Today I think he’s hit a grand slam with BargainDomains.com. The premise is simple: you can list your domains for sale on BargainDomains.com for a maximum of 30% of the appraisal price on sister site Valuate.com. When you take a look at the list of domains on BargainDomains.com, you’ll see that this model will actually work. There are some domains on there at very fair prices. True bargains. Not those elusive “great prices” for “premium domains” that you see everywhere else. There are actually some winners on here. And, as with all great solutions, the beauty is because of the simplicity. Another beautiful but simple feature: domains discounted the most from their appraisal prices are shown higher on the page. This web site is one to follow. Valuate.com’s solid user interface gives quick access to domain data. It’s been a couple weeks since Cybertonic, the same company behind Domaining.com, launched Valuate.com in beta. Valuate uses Estibot 2.0 in the background to create domain appraisals. Now, I’m not usually a fan of automated appraisals. I think I’ll hit the next person who tells me a domain sold below market value “because Estibot says it’s worth x”. But there’s something to be said for the underlying stats used in automated appraisals. The way Valuate.com pulls them together in a simple interface makes it a valuable tool. After entering your domain(s), Valuate.com quickly offers a valuation of the domains. But beyond the valuation, you get one click access to Google Trends for the domain’s terms, DomainTools.com, Archive.org, Adwords preview, and more. 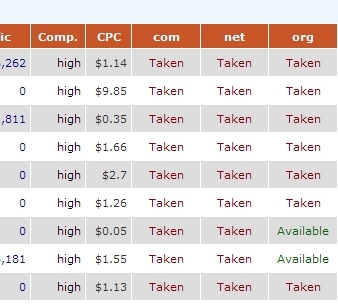 You also get data on traffic rank, Adwords competition, and cost per click. Valuate.com doesn’t change my opinion about automated appraisals. But it’s one of the first systems I’ve seen with a simple, clean interface that gives quick access to the real value in such tools — the underlying data.